So I have to start this off by admitting that I nearly didn’t share this post. It is, by all accounts not exactly the most Pinterest friendly thing I’ve ever done and will probably take me a long, sweet time editing to get a photo that doesn’t show my messy home or my kids making daft faces. Then I realised that this is kind of the whole point. My kids are not stock photos and if they have cheesy grins in this that’s because they totally adored this activity. 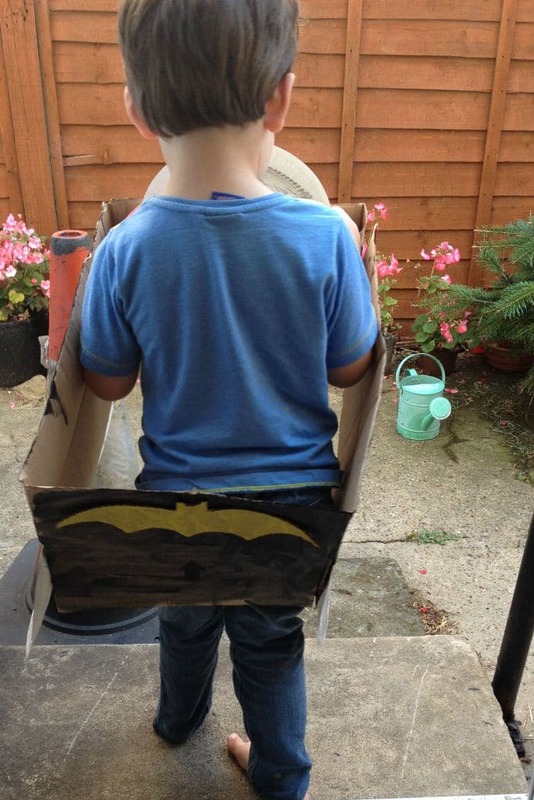 We had a box delivered from Amazon and my son informed me he wanted us to turn it into a Batmobile. You can’t turn requests like that down if you write a crafts blog, it’s a really poor show. 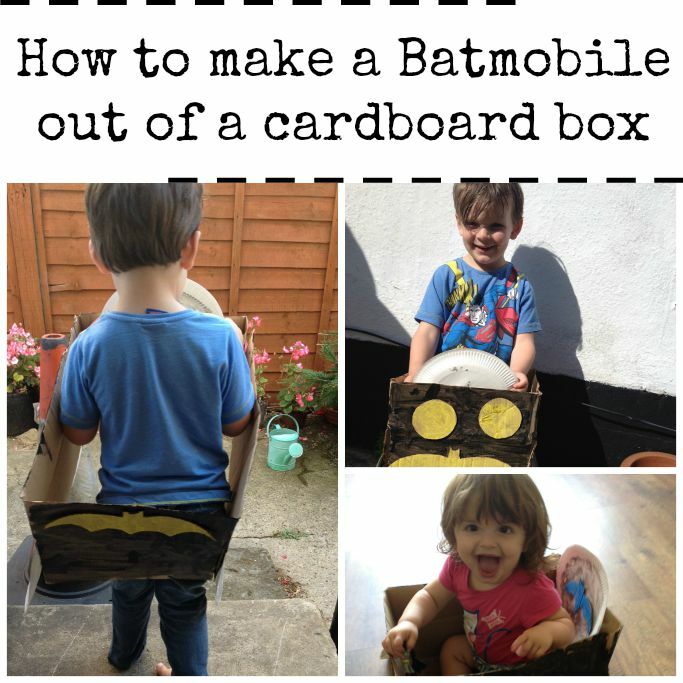 So the challenge was set and all I had to do was try and quickly work out how to make a Batmobile out of a cardboard box! First we unfolded the top and bottom of the cardboard box. I cut the top bit big so it wasn’t too huge and then selotaped the bottom bits of the box together to make one rectangle shape. My kids (my son is 4 and my daughter is 1) then painted it black with the level of attention to detail that is only given to Batman related projects. I tried to give my daughter some paper to paint but she was not up for that at all. Thankfully there was only one small incident of moaning about her painting skills. My son was very certain about exactly how a Batmobile should be built so most of this was following his instructions! From the top of the box that I previously removed I had to cut two round shapes for headlights, one large bat symbol for the front of the car, one for the back and a small one for the steering wheel. He then painted the lights and large bat symbol yellow, the small bat logo blue blue and five paper plates silver (four for the wheels and one for the steering wheel). When all of this was done and dried (never has painting been checked on so much) it was my job to glue everything into place. I recommend using a glue gun for this as in my opinion it dries quicker than superglue and my kids certainly didn’t want to wait! 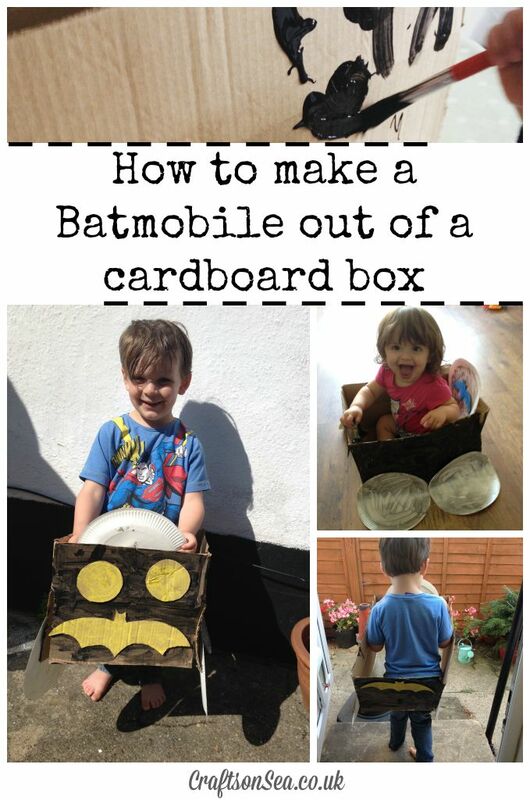 My kids had so much fun playing with this, it kept them busy all afternoon and I know they’re desperate to order some more things through the post so they can have an excuse to get a new Batmobile! 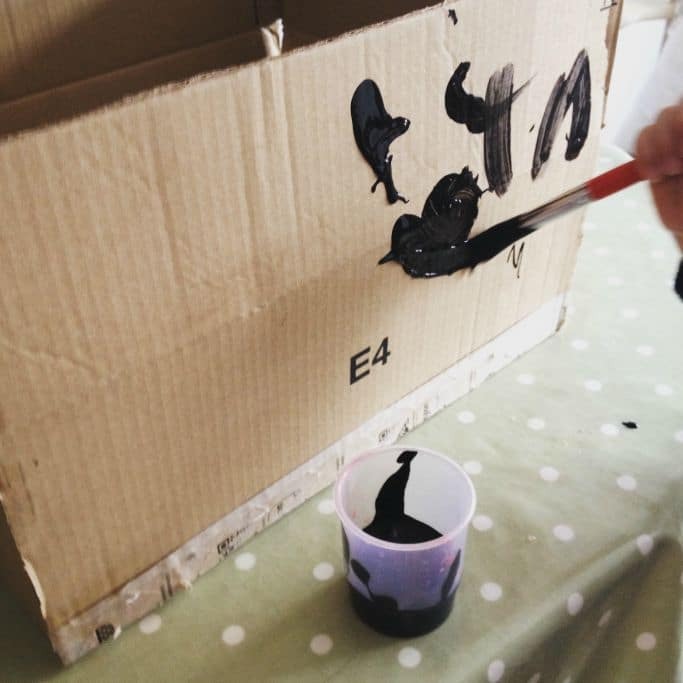 All this summer I’m taking part in a crafts challenge with some of my blogging friends, why not check out what they got up to for this cardboard box challenge? Jen from Mum In The Madhouse made this cool shoebox table football. Louise from Messy Little Monster made a brilliant dinosaur small world in a box. Anna from In The Playroom made this fantastic cardboard box minion. Looking for ways to keep your kids busy? Don’t forget to follow my kids crafts and activities board on Pinterest for hundreds of ideas!